Thank you for joining me for the very first episode of the Local Hearted Podcast. I am your host, Meredith Adler, and in this episode, I introduce myself and talk about how the podcast came about. 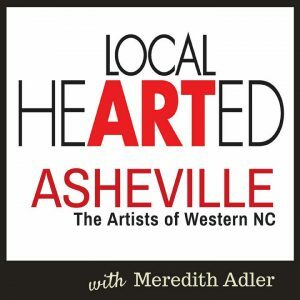 You will learn why I decided to do a show interviewing not only Asheville and Western North Carolina artists, but also people in local businesses who create opportunities for our local artists and provide services to help us with the business end of things. By listening to the Local Hearted Podcast, you will get to know well-known local artists and discover new favorites! In this episode, I thank local artist Leo Monahan (link in list below) and his friend John Otto in California for the creation of the Local Hearted logo. I am so appreciative of their work! Also, I will be forever grateful to singer/songwriter/performing artist Jamie Notarthomas for giving me permission to use his song, “Learning to Fly,” as the theme music for the Local Hearted Podcast. Finding theme music for a podcast is not necessarily a simple venture. Many podcasters buy music clips from the various places online where royalty-free music is available. I spent many an hour listening to music clips and not finding anything suitable. While browsing for the final time, Jamie’s song “Learning to Fly” started running through my mind, after over 20 years of not having seen Jamie. I then remembered that Jamie had a musical reprise version of the song, which would be perfect for voice over for a podcast intro. I found Jamie’s web site and emailed him, thinking surely my email would wind up in his agent’s inbox and Jamie would likely never know of my request. I am thrilled to tell you that Jamie personally replied back within just a few hours, giving me his blessing to use not only the musical reprise of “Learning to Fly” for the intro, but also the version with vocals for the outro, and he sent me his files for the songs! If you like Local Hearted’s theme music, I hope you will check out more of Jamie’s songs at his website http://www.jamienotarthomas.com You can also find his music available on iTunes. I give special thanks to the artists and people in businesses who agreed to be interviewed prior to the launch of the podcast. A majority of these artists have already been interviewed as of this writing, and several are on deck. Either way, a big part of what I am thanking them for is their willingness to participate without having the opportunity to hear any of my other interviews first. They had no way of knowing in advance what my interview process would be like, and they put their trust in what I told them. I really admire them for being game!